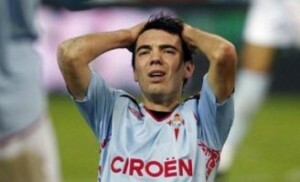 It has been revealed that Liverpool have agreed a deal in principal to sign Celta Vigo forward Iago Aspas. It is said that the £7.7million transfer will be finalised once the necessary documentation has been completed. The 25-year-old becomes manager Brendan Rodgers’ second signing of the summer, having already brought in Manchester City centre-back Kolo Toure on a free transfer. Liverpool have been tracking the Spaniard for some time and the move has been in the pipeline for the last few weeks. Celta Vigo’s successful fight against relegation from the Primera Division on the final day of the season earlier this month held up progress. Once their future was secured the Reds were able to advance the deal, although it took slightly longer than expected because of complications at the Spanish end. Aspas, who scored 12 goals in 34 league appearances last season, was on Merseyside earlier this week for a medical and once that was completed it was just a question of ironing out some red tape issues with Celta.